Mr. Sheshedhar Pandey, an artist, retired army men, was born in the holy town of Maa Vindhyavasini Devi, Vindhyachal, Mirzapur, East Uttar Pradesh, India. When the call and devotion for the art became irresistible, he took voluntary retirement from the uniform service in the year 2001 and ever since then opened his own studio and continued his passion for art full time. Since, childhood he had a penchant and fondness towards art. So, he studied Bachelor of Arts from the University of Allahabad. From time to time in school, college he participated in many art exhibitions. Thereafter, he joined Indian Army and served for 17 years, as a trusted soldier. With his service in the Indian Army he still managed to continue his passion by participating in exhibitions. 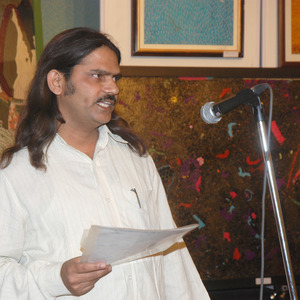 The zeal of artwork is unique in itself as he uses the ready-made Bindi as a medium of expression of his artwork. Bindis are commonly used by the ladies to depict a strong sense of completion and happiness by varied use of bright colors. Bindi is arguably the most visually fascinating forms of body decoration and is used by him for transforming his thoughts and ideas on the unbreakable glass. It is believed that in art, the hand can never execute anything higher than the heart can imagine. His art form transcends to a powerful, stylistic, masterpiece that, in turn, brings him a range of propositions and submissions across the rich heritage and culture of our country. An artist, retired army men, was born in the holy town of Maa Vindhyavasini Devi, Vindhyachal, Mirzapur, East Uttar Pradesh, India.